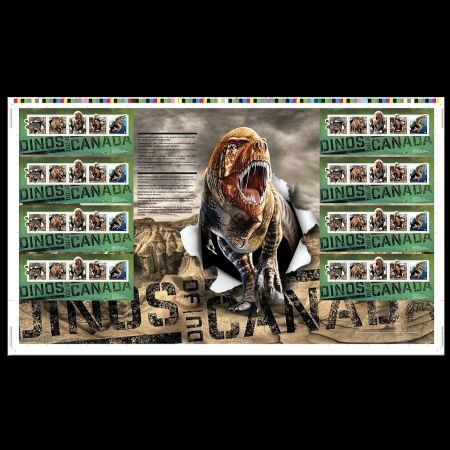 Canada 2015 "Dinosaurs of Canada"
Size (width x height) 28.5mm x 28.5mm, Mini Sheet 159mm by 65mm, Sheet of mini sheets: 608mm by 358mm. 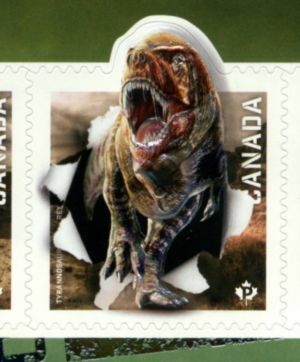 On April 13 2015, Post of Canada issued a set of 5 self adhesive Dinosaur stamps, first time since 1993. 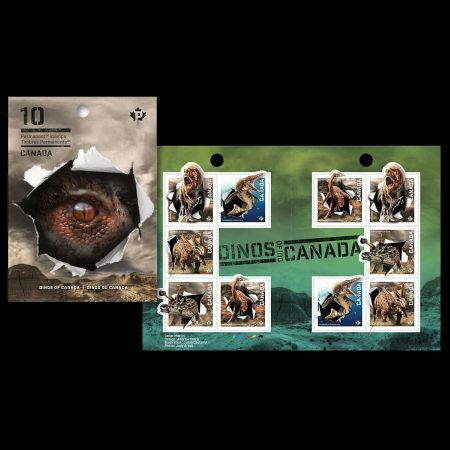 With a 3-D-like design that breaks through the boundaries of a typical stamp (similar to UK stamps 2013) , Canada Post brings to life five prehistoric animals that once roamed Canada. The stamps are presented by Canada Post April 9 at Toronto’s Royal Ontario Museum, the colorful quintet of “thunder-lizards” range from agile, birdlike Ornithomimus edmontonicus to meat-seeking superstar Tyrannosaurus rex, whose modest crown of feathers fails to distract from the slavering jaws and massive, dagger-like teeth of perhaps the greatest predator that ever lived. 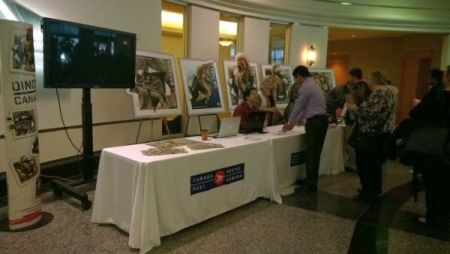 Paleoartist Julius Csotonyi , who drawn images used for the stamps, sign some souvenir stuff for stamp funs. The animals pulse with life, charged by the multilevel embossing and holographic foiling used in most of the designs. They tear their way through barren background images of Dinosaur Provincial Park, one of Canada’s richest sources of dinosaur fossils. 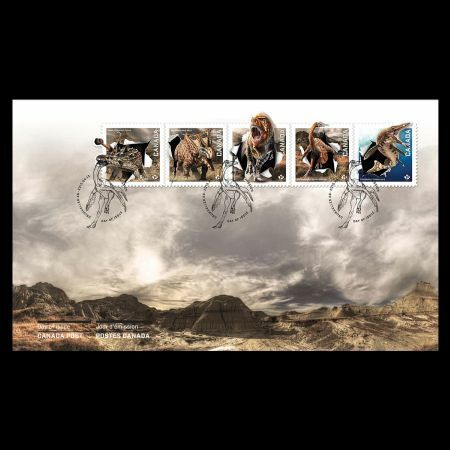 The ancient animals pulse with life on the stamps, through the innovative use of multilevel embossing and holographic on the souvenir sheet versions of most of the stamps. Stamps from the booklet of 10 have the holography, but not the embossing, which makes them detectably different stamps. 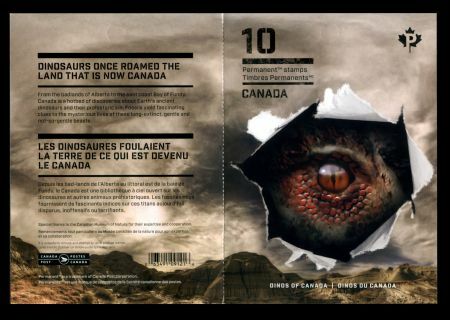 The images of the four terrestrial dinosaurs are pictured tearing their way through barren background images from Dinosaur National Park, northwest of Medicine Hat, Alberta, one of Canada’s richest sources of dinosaur remains. 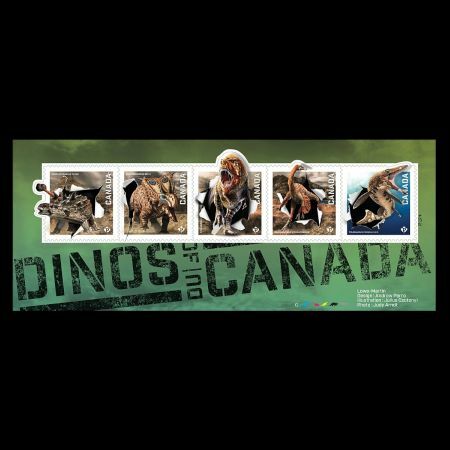 Four persons built design team of there stamps: paleo-artist Julius Csotonyi from Vancouver draw the dinosaurs and mosasaur at their environment, photograph Judy Arndt made some photos of landscapes of Dinosaur Provincial Park in Alberta, Canadian at place where many dinosaur fossils are found, designer Andrew Perro , who has designed several Canadian stamps, compiled images of Julius Csotonyi and photos of Judy Arndt together, paleontologist Dr. Jordan Mallon of the Canadian Museum of Nature provided some scientific background to the paleoartist in order to ensure images of the prehistoric animals are represent most recent scientific view. “It was important to strike an effective balance in pose and colour patterns that were gripping and imposing yet scientifically accurate or plausible,” says Csotonyi, an award-winning natural history illustrator and biological sciences graduate. 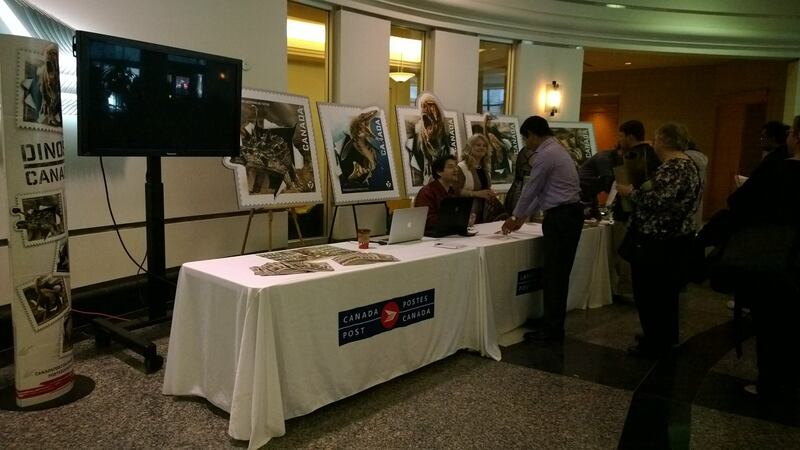 “I was pretty excited about an opportunity like this… it’s kind of neat to spread information about Canadian dinosaurs,” Csotonyi said . “The stranger something is the neater it is.” He hopes the drawings encourage people to learn more about dinosaurs. 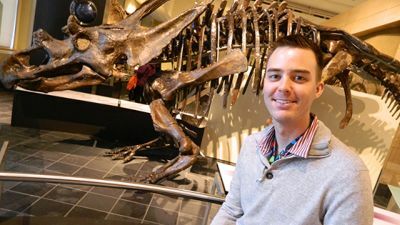 “Any kind of means or media in which we can interest people about science and the funky discoveries about dinosaurs is to me pretty exciting,” he said. "I am a freelance scientific illustrator and biological sciences graduate. My passion has been drawing dinosaurs since childhood, but over the years I have expanded my portfolio to include all branches of scientifically pertinent artwork. I have collaborated on projects with several major museums, paleontologists and book publishers from around the globe, including the National Geographic Society and the Royal Tyrrell Museum, working closely with scientists and drawing on my own scientific background. Recently, I have also illustrated a number of coins for the Royal Canadian Mint. An MSc graduate of Ecology and Environmental Biology (University of Alberta), and a PhD graduate in microbiology (University of Manitoba), I have published scientific papers on pollination-seed predation mutualisms, and unusual bacteria from deep ocean hydrothermal volcanic vents. My scientific background impels me to strive to restore as realistically as possible the broad diversity of environments that earth has hosted in its deep past. My style ranges from pencil, ink, watercolour and pastel to 2-dimensional digital illustrations (which form the bulk of my work) and 3-dimensional digital models. My work encompasses dinosaurs and other prehistoric life, sharks and other living animals, paleobotany, space art and any scientific subject, as well as fantasy and science fiction themes." The image is from "Carleton Now"
"My duties were twofold: to help decide which prehistoric animals would be featured on the stamps, and to vet the artwork and related text for accuracy. 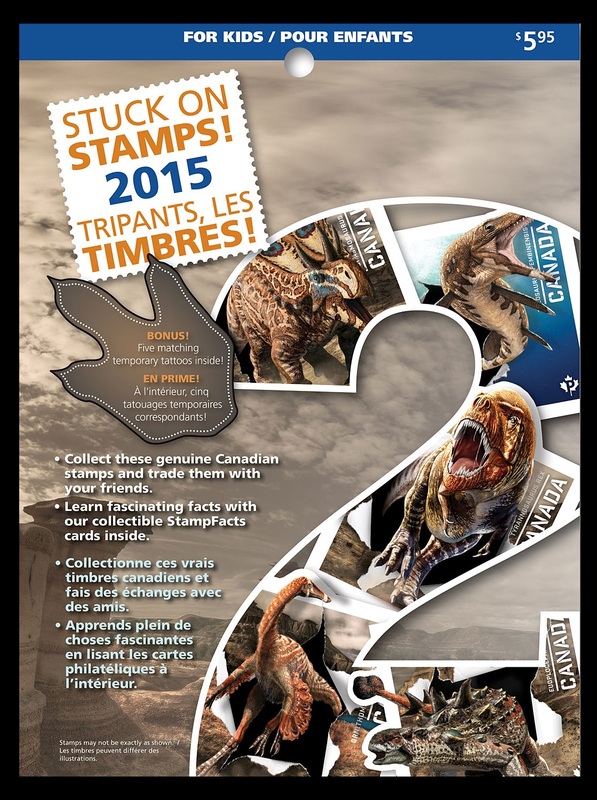 I initially came up with a list of 24 dinosaurs and other prehistoric organisms as possible contenders for the stamps. These contenders ranged from all parts of Canada, all branches of the Tree of Life, and all periods of the geologic timescale. Narrowing down the contestants to just five species was difficult, and there were many worthy animals that did not make the cut. For each of the finalists, I benefited from having direct access to superb fossil remains from each one, all held in our museum’s national fossil collection. The Canadian Museum of Nature, in fact, has the type specimens for Ornithomimus edmontonicus, Chasmosaurus belli, and Euoplocephalus tutus. These are the first of their kind used to describe the species, and have immense scientific and historical value. 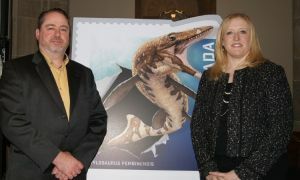 Stamp designer Andrew Perro (left) and paleontologist Dr. Jordan Mallon of the Canadian Museum of Nature (right) speaks about their work on the stamps. 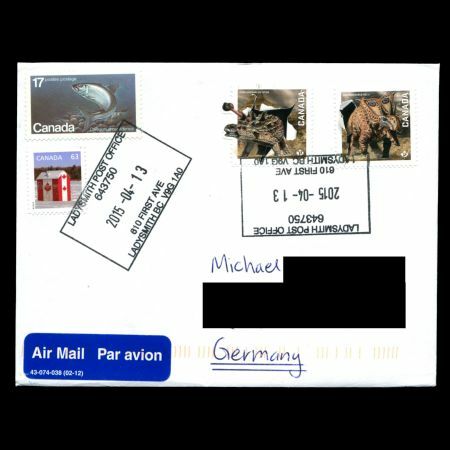 We wanted to be able to say something interesting about each of the featured species, and to draw a connection to Canada—to the places where they were found and to the people they honour. 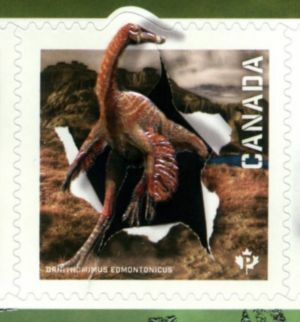 For example, the ostrich-mimic Ornithomimus edmontonicus is named after a rock unit called the Edmonton Formation where it was found, which itself is named after the city of Edmonton. The name of the horned dinosaur Chasmosaurus belli likewise honours Robert Bell, a former natural sciences professor at Queen’s University, and administrative head of the Geological Survey of Canada. 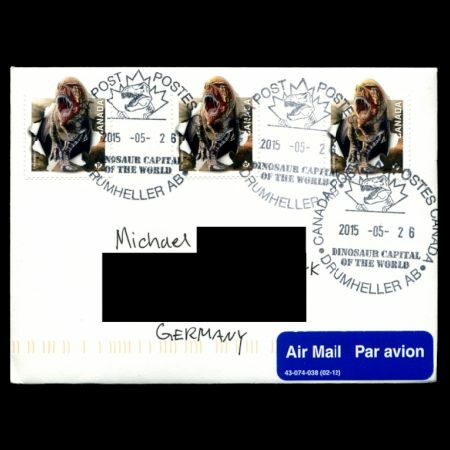 There are many scientific subtleties on the stamps that I hope won’t go undetected. Did you notice that the Ornithomimus has wings? Or that the Tylosaurus has a tail fluke? 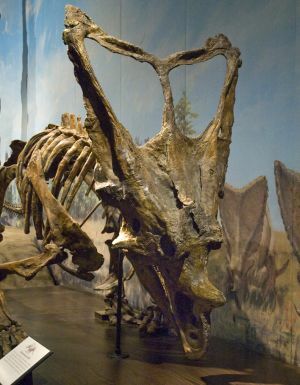 Or that the nostril of the Chasmosaurus is positioned forward on its face, as opposed to back towards its nasal horn? These are all scientific findings that have only come to light in recent years." Euoplocephalus tutus, an herb-eater that was known for its spiky, plated armour. Its complex and unusual series of nasal passages may have warmed inhaled air, improved the animal’s sense of smell or helped it vocalize. Euoplocephalus tutus (meaing "well-armored head") lived between 85 and 65 million years ago, in the late Cretaceous period in Canada. 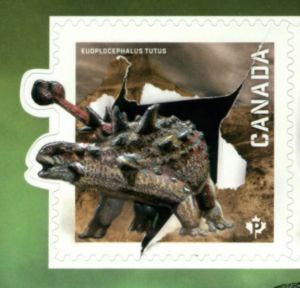 Canadian palaeontologist Lawrence Lambe first described this ankylosaurid dinosaur 1902, giving it the name Stereocephalus, but that name had already been given to an insect, so it was changed in 1910. . Euoplocephalus was a plant eating (herbivorous) dinosaur. It had a complicated nasal structure, which indicates that it probably had a good sense of smell. It had flexible legs, which it might have used for digging. The stiff, low-slung dinosaur had poor teeth (weak dentition), so it probably would have grazed on fleshy low-lying vegetation and shallow tubers. Among the ankylosaurids, Euoplocephalus was exceeded in size only by Tarchia and Ankylosaurus. Euoplocephalus was 20 feet (6 meters) long and weighed over 2 tons, about the size of an elepant. While it was about 8 feet (2.5 meters) wide, it was low-slung, with short, stout legs. The rear legs were larger than the front legs and all four limbs were tipped with hoof-like claws. Like all ankylosaurids, it had a flat, thick, triangular skull. The mouth included a horny beak and the teeth were small and roughly leaf-shaped. It had a short neck. A skeleton of the extinct, heavily armored dinosaur Euoplocephalus Tutus, a herbivore, showing its long row of spikes and its clubbed tail.The entire head and body of the Euoplocephalus are covered with bands of armor, which allowed a surprising amount of flexibility. It was the first ankylosaurid discovered with armored shutters that it could slide down to cover its eyelids! Each piece of armor was composed of a thick oval plate, embedded in the thick surrounding skin, which was studded with short, horny spikes (dermal scutes, like those of crocodiles), which were about 4 to 6 inches (10 to 15 centimeters) long. In addition to the spines running down its back, Euoplocephalus had large horns growing from the back of its head. It also had a bony club at the end of its rigid tail, which it carried above the ground. The tail was muscular, so the club could be swung from side to side for defense. Internally, many bones were fused together to provide support for the heavy armor. The backbone (the dorsal vertebrae) is merged with the ribs, and several of the backbones in front of the hips (presacral vertebrae) were also fused together into a rod. The tail is made from hardened tissues, which are fused to the tail bones. 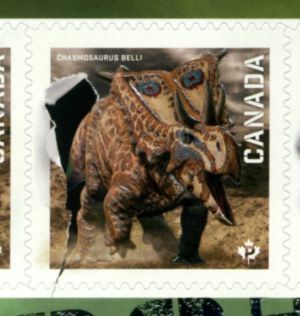 In 2010, paleontologist Philip Currie came across a very unusual fossil in the barren badlands of Dinosaur Provincial Park in Alberta, Canada: a baby Chasmosaurus belli, a ceratopsian dinosaur from the Late Cretaceous. 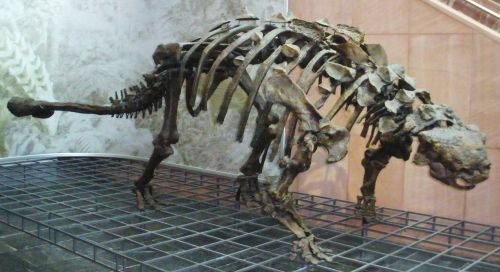 Only the edge of the frill on back of the skull was visible when Currie first came upon it, but eventually he dug out a nearly complete, articulated specimen. The only bones missing were the dinosaur's front legs. Currie is professor of Dinosaur Paleobiology at the University of Alberta, in Edmonton, after three long years of lab preparation, he and his staff are proudly showing off their prize dinosaur and getting it ready to put on display. On August 16, 1991, then high school teacher, Robert Gebhardt from Eastend joined RSM palaeontologists on a prospecting expedition to the exposed bedrock along the Frenchman River Valley to learn how fossils are found and identified in the field. Within a half a day, he discovered the base of a heavily worn tooth, and a vertebra from the tail, both suggesting that they belonged to a T. rex. In June 1994, RSM palaeontologists began excavating the T. rex, one of the largest known carnivorous dinosaurs. Over 6,000 people visited Scotty's excavation site during 1994. The 65 million year old skeleton was the first T. rex skeleton found in Saskatchewan and one of only 12 known in the world at the time. 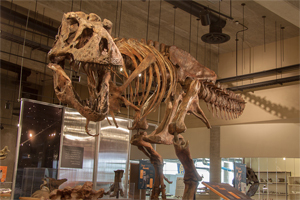 As the individual bones were removed from the rock in the RSM lab, Scotty provided new information both about T. rex and about prehistoric Saskatchewan. Scotty's bones on display at the T.rex Discovery Centre. 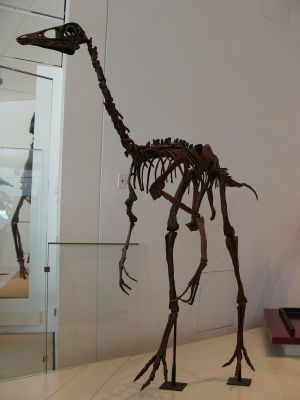 Ornithomimus edmontonicus, now known to have sported long arm feathers. It used its speed to outrun predators and to hunt for prey, which included small lizards and mammals. Ornithomimus (pron. : /ˌɔrnɨθɵˈmaɪməs/; "bird mimic") is a genus of ornithomimid dinosaur from the Late Cretaceous Period (70-65 mya) of what is now North America. In 1890 Ornithomimus velox was named by Othniel Charles Marsh on the basis of a foot and partial hand from the Maastrichtian Denver Formation. Another seventeen species have been named since. Most of these have subsequently been assigned to new genera or shown to be not directly related to Ornithomimus. The best material of species still considered part of the genus has been found in Canada, representing the earlier Edmontonian-age Ornithomimus edmontonicus Sternberg 1933, known from several skeletons. Its exact size is relatively unknown, with the average estimates hovering around 4 to 4.8 meters long, depending on which individuals are considered to be valid species of the genus. It differs from other members of its family in having a shorter torso, longer and slender forearms, very slender hands, and straight hand and foot claws. It has been found with evidence of feathers, including pennaceous feathers on the lower arm, and filamentous feathers on the body of a juvenile, indicating that the more advanced feathers were features of adults only. 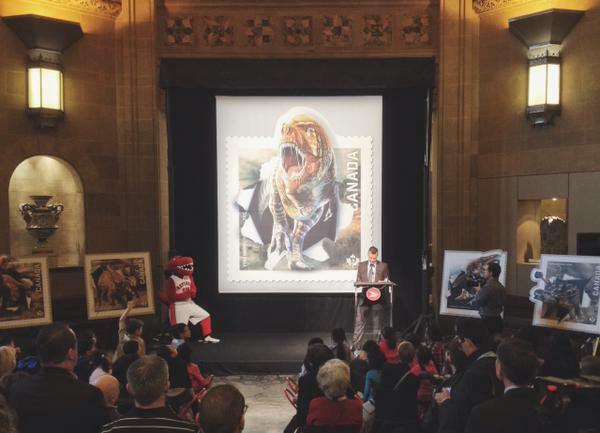 CFDC Executive Director Peter Cantelon says they are simply speechless at the beauty of these stamps and are so happy Bruce was selected for this honour. 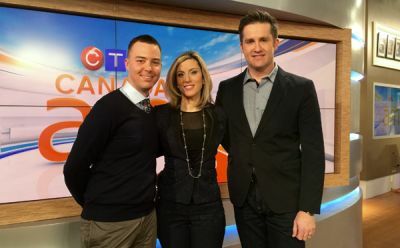 "To have Bruce involved in all this and have the CFDC involved in all this is affirming in the direction we've been taking. It's a huge honour to be ranked with the other leading museums of paleontology in the country. We're all just speechless"
Bruce lived during the late Cretaceous period, approximately 80 million years ago. He swam in a deep sea environment with numerous other marine reptiles. This ocean is termed the Western Interior Seaway and split North America in two. The Seaway spanned from the frigid waters of the Arctic Ocean to the warm currents of the Gulf of Mexico. Bruce belonged to a group of Mosasaurs called the Tylosaurs. 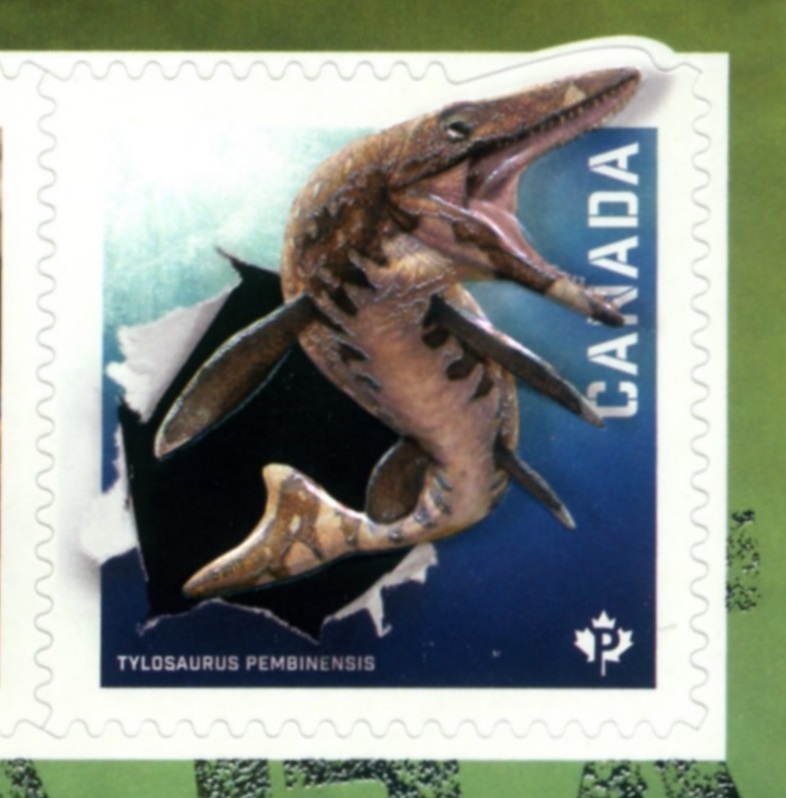 These Tylosaurs were the largest of the Mosasaurs, Bruce being the largest in Canada for this time period, approximately 43 feet long (~13m) from snout to tail. Bruce was a fierce predator, top of the food chain in the Seaway eating anything it its path from plesiosaurs to ammonites (shelled organisms). Palaeontologists think the Mosasaurs lineage was branched off from a lizard group know today as the Monitor Lizards. In 1974 Bruce was discovered north of Thornhill within the Pembina Member of the Pierre Shale Formation. It took approximately two field seasons to excavate the skeleton. The skeleton was reasonably complete with 65-70% of the original bones. 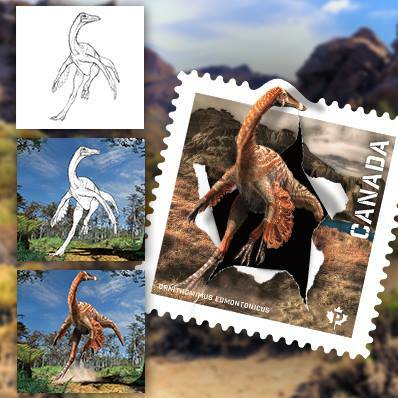 FDC (Ornithomimus edmontonicus is on post mark. 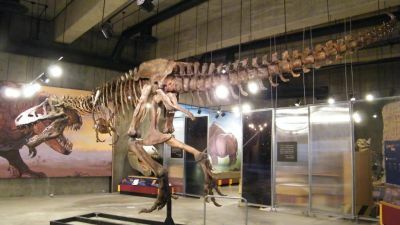 The cancellation site is Drumheller, Alberta, home of the Royal Tyrrell Museum of Paleontology, one of Canada’s most important dinosaur museums.) Collector pack, it’s a collector’s dream pack! 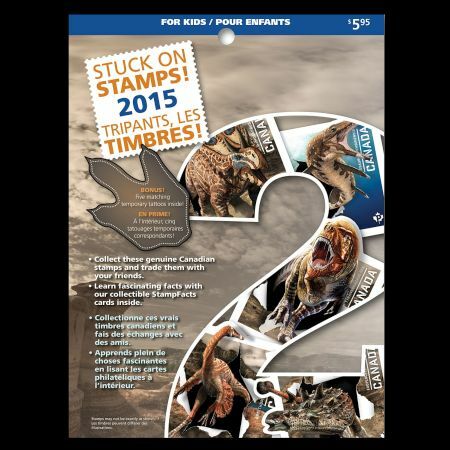 Big kids and small will enjoy collecting the latest 5 dinosaur stamp releases and 5 matching dinosaur temporary tattoos.